Italien - Augsburg - Italien - Frankreich - Kreuth: Eine hoffentlich letzte Etappe für das NRHA European Derby 2017 gibt es im Umfeld der EQUITANA Essen zu hören. Das Derby soll nun auf der EquitaLyon in Frankreich stattfinden, vom 1. - 5. November. Ein offizielles Statement der NRHA USA steht noch aus, perfekt ist dieser Termin aber nicht: Viele Reiner bemängeln die kurze, zeitliche Distanz zwischen NRHA Breeder Futurity in Kreuth, NRHA European Derby in Lyon und IRHA Futurity in Cremona. Die NRHA USA hat heute die Meldung von wittelsbuerger.com aus dem März 2017 bestätigt, daß das NRHA European Derby vom 1. - 5. November 2017 in Lyon/ Frankreich stattfindet. Zuvor waren Sandra Quade (ReadySteadyShow, Germany), Manuel Bonzano (23 Quarter Horses, Italy), Helmut Schulz (Westernstar HD Schulz, Austria), Corinna Schumacher (CS Ranch, Switzerland) und Kader Ikhllef (Parc Equestre Francilien, France) im Gespräch, nachdem die NRHA Germany die Organisation in Kreuthkurzfristig abgesagt hatte (mehr dazu hier). Damit findet kein ein großes NRHA European Event in Deutschland statt, anders wie ursprünglich geplant ("eines der beiden höchstdotierten Reining-Veranstaltungen Europas in Deutschland halten", mehr dazu hier). Die NRHA European Futurity wird in den kommenden fünf Jahren im italienischen Cremona stattfinden, zusammen mit den NRHA European Affiliate Championships 2018 und 2019. Interessant dabei ist, daß der Italian Reining Horse Association (ItRHA) damit ein mehrjähriger Kontrakt seitens der NRHA USA eingeräumt wird. Diese "mehrjährige Vertragslaufzeit für die Ausrichtung" war von der NRHA Germany immer als Voraussetzung für die Asrichtung des Derbys genannt worden. Oklahoma City, April 19 – Following NRHA Germany’s decision not to host the 2017 edition of the NRHA European Derby in Kreuth, Germany on July 23-30, the National Reining Horse Association (NRHA) Executive Committee, alongside the NRHA European Affiliate Council Executive Board, has worked endless hours in order to best accommodate our European members, owners and riders. After considering the generous availability to host and manage the event by Sandra Quade (ReadySteadyShow, Germany), Manuel Bonzano (23 Quarter Horses, Italy), Helmut Schulz (Westernstar HD Schulz, Austria), Corinna Schumacher (CS Ranch, Switzerland) and Kader Ikhllef (Parc Equestre Francilien, France) – who our heartfelt thank you goes to – the NRHA European Council Executive Board put forth a recommendation to the NRHA Executive Committee to move forward with Equita Lyon being the hosting venue. The latter was approved and, moving forward, details will be posted on the NRHA.com website. “On behalf of Sylvie Robert, director of equestrian events for GL events and president of Equita – and myself – I would like you all to know that we are very happy to organize this beautiful event in cooperation with NRHA,” said Cristine Rigollet of GL events Exhibitions. First held in 1995, Equita Lyon has become one of the most prestigious events in the equestrian world for both professionals and amateurs and provides over 100 hours of TV coverage worldwide. All levels of riding competitions are represented, from World Cup to club-level. The show attracts over 150,000 visitors and the Euroexpo trade-show boasts vendor space exceeding 130,000m². The www.equitalyon.com website, created to adjust to smartphones and digital tablets, counts close to three million page visits from September to November yearly. Digital strategy is developed around this web site, as well as on social media, and over 20 newsletters are sent annually. 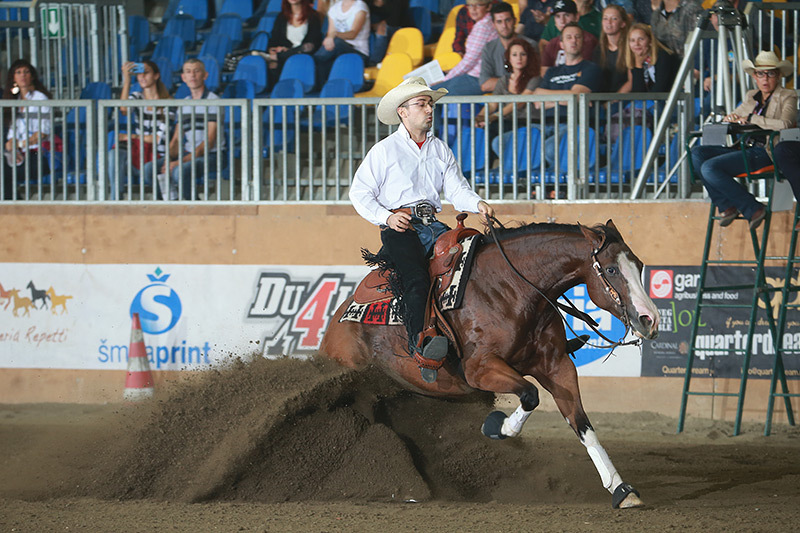 The 2017 edition of the NRHA European Futurity was held in Cremona, Italy. This was the first year at this facility and proved to be very successful. The NRHA European Council met in Cremona and approved an additional 5-year contract between the Italian Reining Horse Association (ItRHA), who will manage the event, and CremonaFiere, the host venue for the European Futurity. During the meeting, the Council also approved the proposal that the NRHA European Affiliate Championships be held in conjunction with the European Futurity in 2018 and 2019.